January Journal: Day 29 — Ginger writes. I like sharing recipes on weekends because it takes less thinking. Not less time, but less thinking. We are friends with our chiropractor and his wife, and have had them over a couple times in the summer. The first time we had them over, they brought this broccoli salad, which my friend Katherine referred to as "Jeremy's specialty." Katherine said all their relatives ask Jeremy to bring this salad to every family gathering. And once I tasted the salad, I knew why. So, of course, the next time we had Katherine and Jeremy over, I requested Jeremy's broccoli salad. He gladly obliged, and later when I asked Katherine for the recipe, she gladly obliged too. But she gave me the recipe in non-precise terms. And believe it or not, I just went with it, and have been pleasantly surprised again and again by how good the salad turns out without measuring amounts. I used to save this salad for special occasions, assigning it to the category of good cookout material for summer, a fresh and healthy side to go with BBQ ribs and the like (which it is, of course). 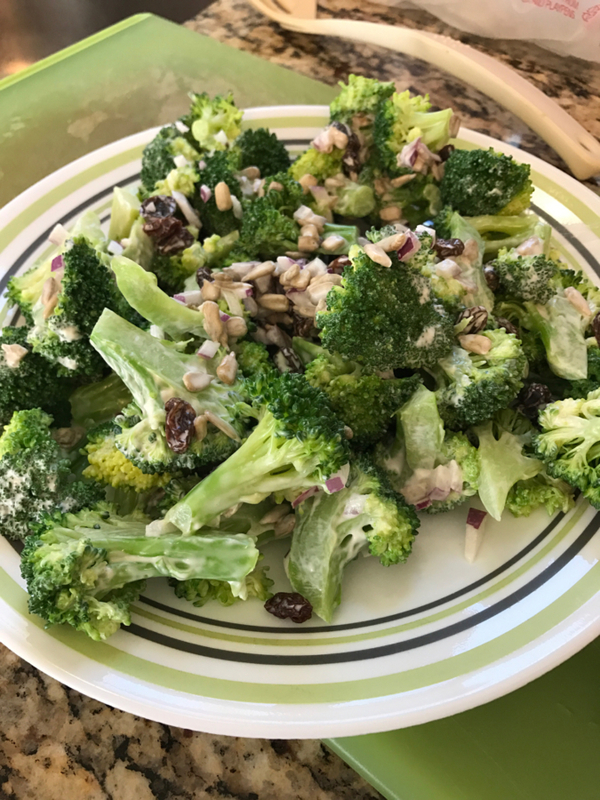 But once I started making the salad often enough to establish a quick routine, it has become a commonplace, but never boring, weekday (or weekend) lunch....at least for a broccoli lover like me. So the next time the broccoli notion strikes you, try this blanched broccoli salad. It's a great healthy dish, and filling too.